I found this recipe when I had a few very ripe bananas I needed to use up. I have since made these countless times and they are so good. Here is the original recipe over at http://www.texanerin.com. I have only altered the sweetener, the type of fat and salt content, otherwise it is a foolproof delicious muffin. Anytime I can cut sweetener I do cause my motto is, “if you don’t need it, don’t eat it”. However I don’t always adhere to my motto. 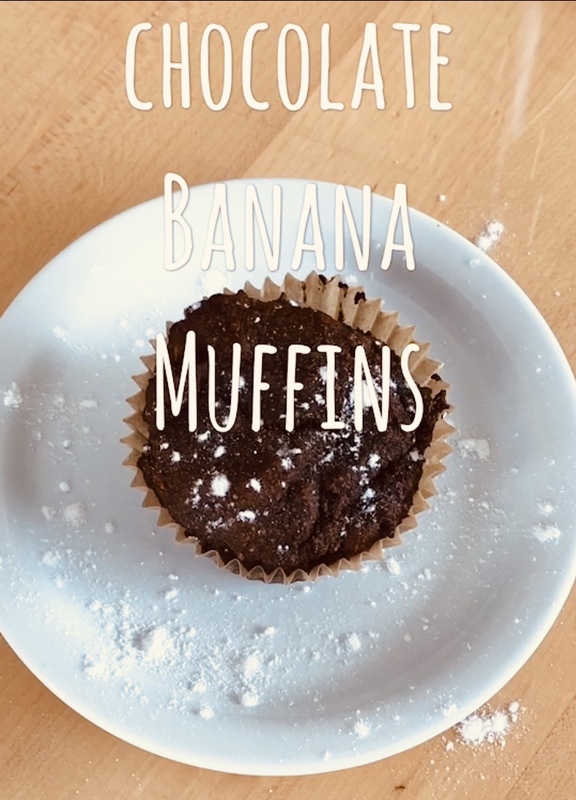 My daughter has offered to make and post some food videos on instagram, so you can check out her chocolate banana muffin video at my kleecreations instagram account. Let cool on a wire rack and enjoy! 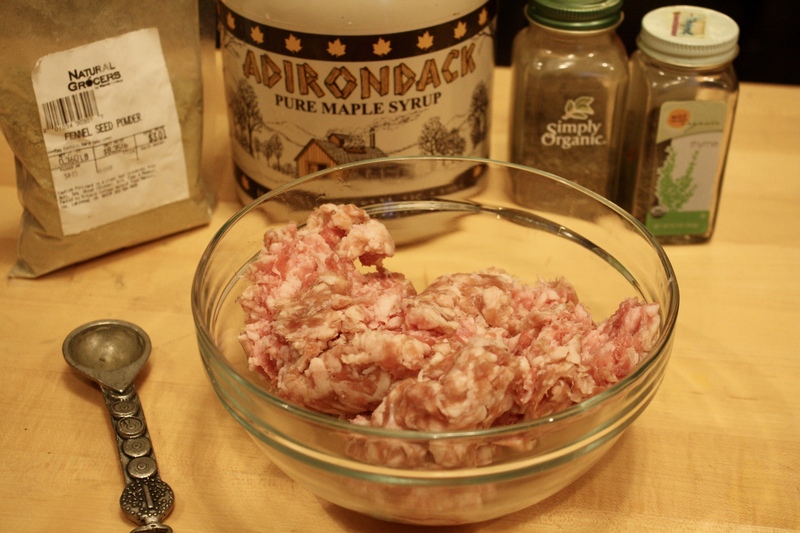 I wanted to share with you my simple spice recipe for breakfast sausage. I like to get plain sausage when I have my animals processed, that way I can season the sausage according to what my recipe calls for. Also I then get to know exactly what is used to season my meat. I am not a big fan of MSG or other undesirable compounds sneaking into my food. Back in college I went on a dinner date to an all you can eat Chinese Buffet, yes I know cheap date. I was not as much of a foodie back then and saw no problem with my date’s choice of eating venue. As I was consuming my plate of varied Chinese buffet delicacies, I felt a tightening in my chest and my heart rate sped up to an alarming speed. My tongue also swelled up and I was extremely thirsty alas, I kept eating, until at some point, I really thought I was having a heart attack. I was too dumb and embarrassed to say anything, so I put my fork down and drank water hoping the symptoms would pass. It wasn’t until later in the evening that they started to dissipate. I realized later that all the MSG in that Chinese buffet food was the culprit to my scary and bizarre symptoms. Needless to say I learned my lesson and have become much more aware of my food and of speaking up when I feel uncomfortable in all situations, regardless of the company. I use this spice blend in pork, elk, and antelope ground sausage. In a medium-sized bowl add the ground sausage and all the above ingredients. Mix well with your hands. 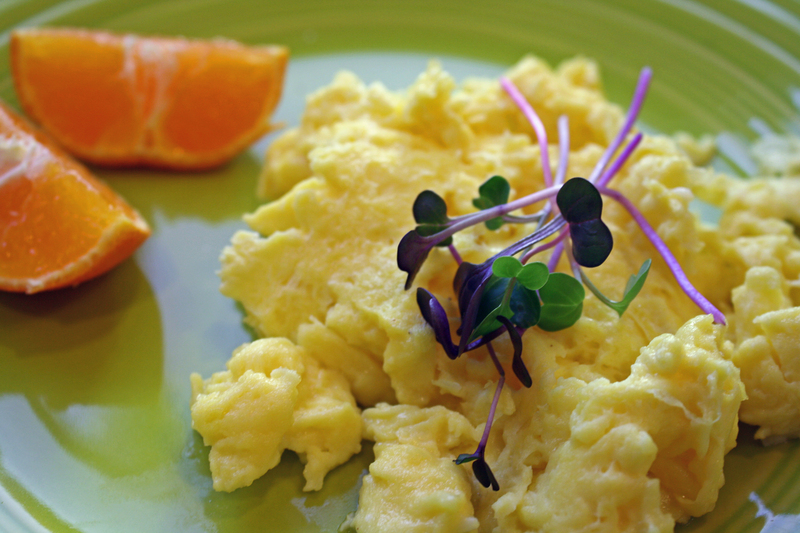 Use as you like for breakfast….make patties and fry in a skillet or fry loosely and add eggs for a breakfast scramble. Enjoy! Makes approximately 8 breakfast sausage patties. Happy Holidays! I hope your holiday season is joyful and peaceful. I grew up in upstate New York and until I was in high school, we would get real winter with lots of snow. It seems every Christmas of my youth, we would get a new red plastic sled. This was because either we had broken the previous year’s sled, or the kid down the street ,Ray Ray, had stolen our sleds. You know someone is badass when they are called by their first name twice, and let me tell you Ray Ray was. That kid was tougher than nails and crazy wild. I once saw him fall out of a 20 foot tree fort and land like a ton of bricks onto his back. We all thought he was dead, only to be amazed when he got up, swore a mouthful of expletives and proceed to climb back up the tree to the fort (which he lived in for a while). Ours was a rough and tumble childhood (not as rough as Ray Ray’s), but all the same we played hard and were always outside. The hills we sledded on typically had barbed wire fences at the bottom, so you had to bail off your sled or be sliced to smithereens. Depending on the snow conditions, we would either use our red plastic sleds or if it was packed and icy we used the red flexible flyer runner sleds. We’d pile 4 kids deep on top of Michael D. and fly down an old unused road, each bump and turn tossing off the top kid. Someone usually ended up with at least a bloody nose or a head full of burdocks. Ahh such fond memories of my wild free range childhood, no cell phones or computers or ipads or over protective parents, just simple fun and good times. These eggs are a far cry from rough and tumble. They are velvety and creamy goodness. You have to dedicate a little more time and focus to them, but you will be rewarded greatly in the end. Follow Uncle Ted’s directions to the tee (he is a foodie through and through and knows his stuff), and enjoy the best scrambled eggs you have ever tasted….guaranteed!! Heat a small fry pan on medium heat, use a pan that matches the amount of egg meaning not too big or not too small. Crack the eggs into a mixing bowl. Uncle Ted recommends removing the bit of white that connects the whites to the yolk. With a whisk vigorously whisk the eggs until a foam forms on top. (approximately 80 whisks). Salt and pepper to taste. When the eggs are foamy, add the butter to the pan and pour the eggs in. Now here is where the focus comes in…continuously stir the eggs with a spatula DO NOT lose focus. When the eggs are still a bit wet pull them from the heat stir one more time and serve immediately. This is a photo from my Iphone (excuse the bad quality) from our last family excursion. We did a horsepack trip into the mountains a couple of weekends ago to listen to the elk bugle and to hike a ridge. After so many of these trips, I have streamlined my food prep to be mostly at home with easy cooking out in the field. This is a picture of our breakfast burrito I thought I would share with you, so you have a hearty breakfast idea for your next camping trip. 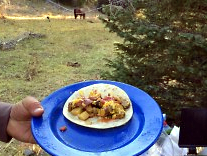 Notice the horse in the background eating calmly? Little did we know they would take off in the night and run all the way back to the truck, leaving us to abandon the tack and gear and hike the 6 miles out. Yes we did catch up with the wild horses and retrieve our gear a day later and came home with a good tale to tell. A great family adventure!!! Heat a skillet up to medium on the stove top sauté the garlic and onions 2-3 minutes. Add in the potatoes and sauté until they are just starting to soften. Add in the sausage and cook until done. Let this all cool and package for the trip. Out in the great wild all you have to do is dump some burrito mix into the pan and heat it up adding your desired amount of eggs. Serve on a tortilla (or not) with some salsa. Add some cheese if you tolerate it and Enjoy! This makes about 8 servings. Well it has been quite a while since I have posted, and I apologize for that my faithful readers (all 2 of you)!! A crazy busy fun summer it has been so far at Hillbilly Haven and beyond. Lots of company has come and gone, and we did a little family trip to the east to visit and swim, swim, swim. We butchered the meat birds and the freezer is full of poultry. I have put up some dill pickles and pickled beets, my food hoard is coming along nicely for the winter. The pigs are growing daily enjoying their summer, I’m still coming to terms that they will be part of my food hoard come the winter. Our one staple through it all has been these Paleo plantain waffles. I so wish I could take credit for these babies, but alas I cannot. The only thing I did was make them into waffles instead of pancakes and that idea came from Chris Kresser. 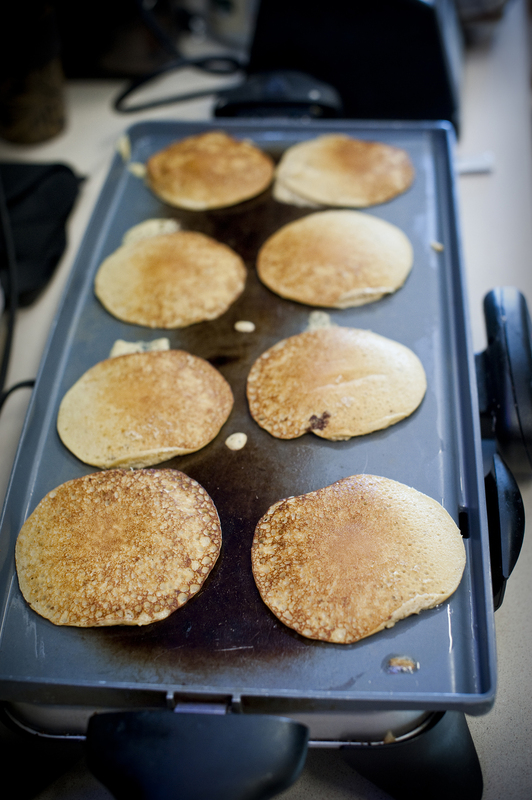 I found the plantain pancake recipe HERE at The Paleo mom website. She has some awesome recipes with plantains and other foodstuffs, check her out. They are fast to make and taste great and ALL of my family members like them which is quite a feat!! Peel plantains (I find it easier to quarter them before I peel them) and place pieces in your blender (preferred) or food processor (okay) with the eggs. Blend to form a smooth batter (if your blender has a smoothie function, that works well here). Add the rest of the ingredients to the blender or food processor and process on high for an additional minute (or 2-3 with a food processor to get a really good smooth batter). 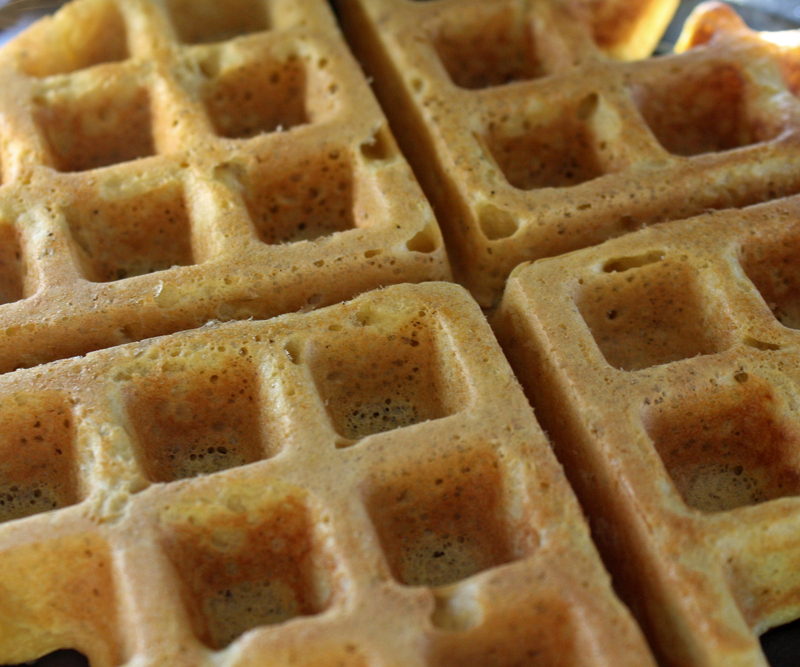 Heat your waffle iron and pour the batter in, cook according to your iron’s directions. Happy May Day!! Man, the year just starts to fly by after January! We are enjoying some fabulous spring weather here in Montana, a little sunshine mixed with rain and snow. The rainy days always have me in the kitchen whipping up a baked good (any excuse to bake, then of course eat it). 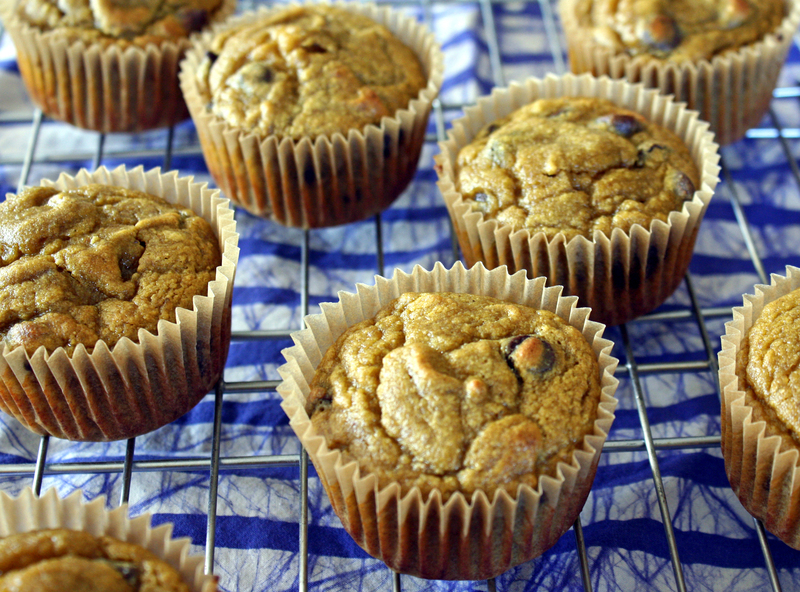 These muffins are a perfect way to use up the ripened bananas you have lying around. They are also a great way to get some chocolate into the mix too. The problem is you can’t eat just one! This recipe is slightly adapted from Elana Amsterdam’s cookbook, Gluten-Free Cupcakes. I have featured another recipe from her book in the past, and this is another great one to try. Her cookbook is loaded with all versions of cupcakes with new and old twists. You can check it out HERE. She calls it a cupcake and adds frosting I call it a muffin as it requires no frosting in my opinion. Give a try, and see what you think! Preheat the oven to *350 degrees. Line a muffin tin with 9-10 muffin papers. Place the bananas, coconut oil or butter, dates and eggs in a high-speed blender or food processor and blend until smooth. Add the rest of the ingredients and mix until all is well incorporated. Stir in the chocolate chips or berries if using. Bake for approximately 20 minutes or until the muffin springs back to your touch. Happy belated Valentine’s Day! I don’t feel too bad for the tardy post as I think we should celebrate love (and chocolate) everyday!! I got to go to my daughter’s class last Friday, and cook a Valentine’s breakfast for her and her classmates. 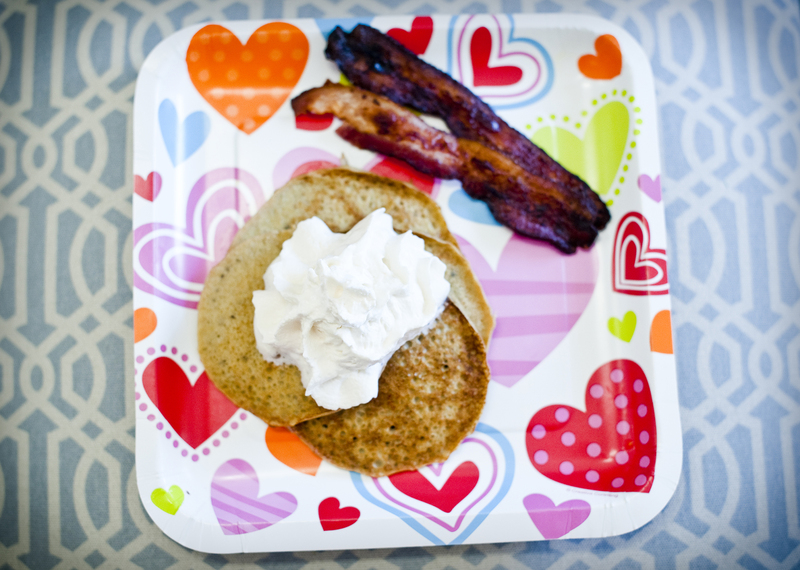 Of course, I highly suggested doing a grain free pancake, and was met with eagerness from her teacher and Lynn (my co-cook and friend and the photographer who took these awesome photos). On a side note Lynn has a BEAUTIFUL blog featuring all things Montana with a heavy emphasis on food, you NEED to check it out HERE. She is a very talented photo-journalist as you will plainly see when you go to her blog!! Okay if I haven’t lost you to Lynn’s blog, onto the paleo pancakes. I love these as they are so easy and fast to make and taste delicious. I watched as the kids threw away their plates and 90% of them were empty, I think they enjoyed the pancakes! Throw all the ingredients into a high speed blender or food processor and mix until smooth. If the batter seems thick add another egg this will depend on the size of your banana and plantain. Pour the batter onto the skillet in the desired pancake size. Make sure to let the pancakes cook well on the first side (don’t flip until you see some bubbles), especially if they are all banana, as they will be a bit delicate to flip.